For the republic, see Nagorno-Karabakh Republic. Nagorno-Karabakh is a landlockit region in the Sooth Caucasus, lying between Lower Karabakh an Zangezur an coverin the sootheastren range o the Lesser Caucasus muntains. The region is maistly muntainous an forestit an haes an aurie o 4,400 square kilometres (1,700 sq mi). Maist o the region is governed bi the Nagorno-Karabakh Republic, an unrecognized, de facto independent state establisht on the basis o the Nagorno-Karabakh Autonomous Oblast athin the Azerbaijan SSR o the Soviet Union. The territory is internaitionally recognized as pairt o Azerbaijan, although it haes no exercised pouer ower maist o the region syne 1991. Syne the end o the Nagorno-Karabakh War in 1994, representatives o the governments o Armenie an Azerbaijan hae been hauldin peace tauks mediatit bi the OSCE Minsk Group on the region's status. The wird Nagorno- is a Roushie attributive adjective, derived frae the adjective nagorny (нагорный), which means "highland". The Azerbaijani name o the region includes similar adjectives "dağlıq" (muntainous) or "yuxarı" (upper). Such wirds are no uised in Armenian name, but appeared in the offeecial name o the region durin the Soviet era as Nagorno-Karabakh Autonomous Oblast. Ither leids apply their awn wirdin for muntainous, upper, or hieland; for example, the offeecial name uised bi the Nagorno-Karabakh Republic in Fraunce is Haut-Karabakh, meanin "Upper Karabakh". The wird Karabakh is generally held tae oreeginate frae Turkic an Persian, an literally means "black garden". The name first appears in Georgian an Persian sources o the 13t an 14t centuries. Karabagh is an acceptable alternate spelling of Karabakh, and also denotes a kind of patterned rug originally produced in the area. In an alternative theory proposed bi Bagrat Ulubabyan the name Karabakh haes a Turkic-Armenian oreegin, meanin "Greater Baghk" (Armenie: Մեծ Բաղք), a reference tae Ktish-Baghk (later: Dizak), ane o the principalities o Artsakh unner the rule o the Aranshahik dynasty, which held the throne o the Kinrick o Syunik in the 11t–13t centuries an crieed itsel the "Kinrick o Baghk". Nagorno-Karabakh is aften referred tae bi the Armenians livin in the aurie as Artsakh (Armenian: Արցախ), designatin the 10t province o the auncient Kinrick o Armenie. In Urartian inscriptions (9t–7t centuries BC), the name Urtekhini is uised for the region. Auncient Greek sources cawed the aurie Orkhistene. ↑ The BBC World News. 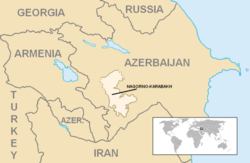 Regions and territories: Nagorno-Karabakh, BBC News Online. Last updated October 3, 2007. Retrieved November 21, 2007. ↑ C. G. Ellis, "Oriental Carpets", 1988. p133. ↑ PanArmenian Network. Artsakh: From Ancient Time to 1918. PanArmenian.net. June 9, 2003. Retrieved November 21, 2007. ↑ Strabo (ed. H.C. Hamilton, Esq., W. Falconer, M.A.) . Geography. The Perseus Digital Library. 11.14.4. Retrieved November 21, 2007. Wikimedia Commons haes media relatit tae Nagorno-Karabakh. This page wis last eeditit on 18 August 2017, at 19:30.